Raising Ella Lynn: Ella has an Entourage! 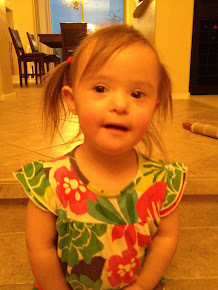 On October 29th, we will join with 2000 other people to walk on behalf of those just like Ella with Down syndrome. I want Ella's team to have not only the most walkers, but the most donations. Why? Because she is worth it... Because all kids with Down syndrome deserve a walk that rivals the biggest fundraisers out there. Because while Step Up For Down Syndrome 2011 might not have the word cancer or disease in it, there are a lot of kids with Down syndrome living with those very things and we need to raise money to support them. Ella's Entourage - Donate here! 3. Pass this on to 3 other people you know. Tell them that for what it costs to buy a Starbucks coffee, they can make a donation to Ella's team and support a wonderful cause. In all seriousness, I set a huge goal for Ella's team and I want to meet it. I know a lot of people, my friends and family know a lot of people, if we could get 2000 people to each donate 5 dollars, we would reach our goal. If you can donate more, we would be forever grateful. The money goes to support so many things to better the lives of those with Down syndrome, how can you not help?